6 Why Advertise With Us? LILY ROSE ENTERTAINMENT, LLC is the parent company of LILY ROSE WED, a digital magazine featuring the very best in multi-cultural weddings, events, and designs. 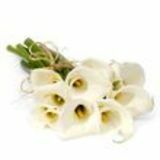 Founded by Shea Thomas, the company was named after the ownerâ&#x20AC;&#x2122;s two favorite flowers: calla lilies & roses. OUR MISSION is to be a planning and entertainment resource for couples and industry professionals before, during, and after the wedding day. In Every Issue: I. Features: Various topics: business, real estate, relationships, and wedding planning. Why Advertise with Us? 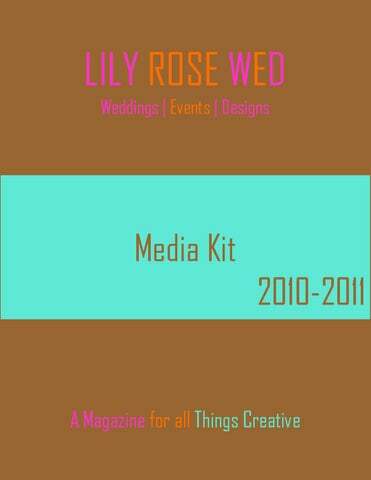 LILY ROSE WED Weddings | Events| Designs We are a consumer and Business 2 Business (B2B) publication. When you advertise with us, you will reach a global audience interested in purchasing your product. Since we are an online publication, with a print on demand component, we are able to offer great rates. DEMO & PSYCHO GRAPHICS With an estimated 2.4 million couples tying the knot annually, the business of weddings is a $165 billion industry. The celebrations are multi-cultural, dynamic events that unite generations of families and friends. TARGET AUDIENCES: GENERATIONS Traditionalists: Born Prior to 1945 Baby Boomers: Born 1946-1964 Generation X: Born 1965-1980 Generation Y: Born 1981-2000 Sources: Association of Bridal Consultants, Lily Rose Entertainment, LLC Consumer Spending Survey. 15 Second Spots: $1000 Per Month 30 Second Spots: $2500 Per Month 60 Second Spots: $5000 Per Month 90 Second Spots: $7500 Per Month 120 Second Spots: $10,000 Per Month Pricing is the same For a full size horizontal banner. A “Sponsored By” tag along with your package category will appear at the end of the programming. PSA’s will be aired within the program for non-profit organizations.